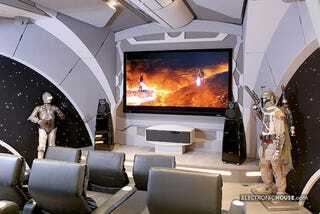 Electronic House has this rad story of a home theater designed to resemble the control deck of the Death Star. The entire thing was designed by Doug Chiang, the lead designer on Episodes I and II. DVDs are tucked behind a hidden door replica of Han Solo in Carbonite, and the entire starfield is lit by fiber optics. One wonders what kind of person gets into a project like this. Apparently, a triple-threat geek couple, Vic Wertz and Lisa Stevens. They used to run the Official Star Wars Fan Club, met while Lisa worked at Wizards of the Coast, and they paid for the whole thing by selling D&D guidebooks and 20-sided dice at their company, Paiso Publishing. Lisa and Vic, I need to know more about this system, so drop me a line if you read this. And Definite Audio out of Bellevue Washington did the AV setup. Here's an esoteric equipment list and another photo, but the full gallery can be had at Electronic House.